Layer on the tortillas with our Beef Enchilada Casserole recipe! You can make a delicious Beef Enchilada Casserole with just 20 minutes of prep time. Brown meat in large skillet; drain. Stir in soup and 1 cup VELVEETA. 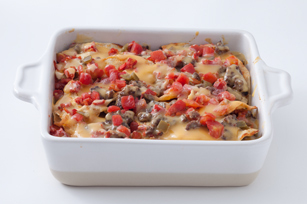 Spoon 1/3 of the meat mixture into 8-inch square baking dish; cover with 6 tortilla halves and 1/4 cup tomatoes. Repeat layers. Top with remaining meat mixture, tomatoes and VELVEETA; cover. Prepare as directed, substituting 2 cups chopped cooked chicken for the browned ground beef. Assemble recipe as directed. Refrigerate up to 24 hours. When ready to serve, bake, covered, at 350°F for 30 min. or until heated through. For a milder flavor, drain the tomatoes before using as directed. Or, prepare using RO*TEL Mild Diced Tomatoes & Green Chilies.